We bring you a new mod focused on spawn new mobs. 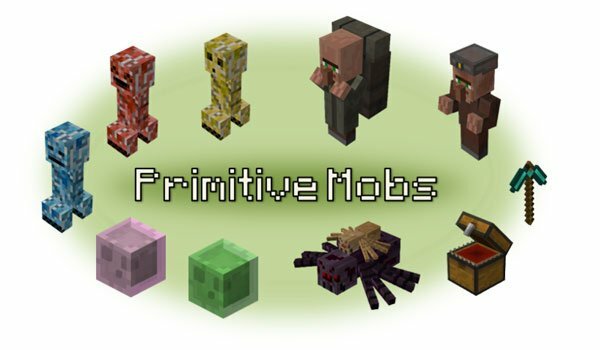 New mobs added on Primitive Mobs 1.7.2 and 1.7.10 mod are mostly hostile, though there are also two peaceful mobs such as the “Travelling Merchant” and “Lost Miner”. The first is a merchant village-like, but with a big sack on his back, while the second is a miner who’s missed which we’ll find when we are undermining. Turning to the hostile, the number is eight new mobs, among which are three variants of creeper, slime’s two variants of an aggressive hood, a new variant of spider. Also we may encounter with tools scattered across the world, but watch carefully before get close . How to install Primitive Mobs Mod for Minecraft 1.7.2 and 1.7.10? New occurrences of mobs in your Minecraft!